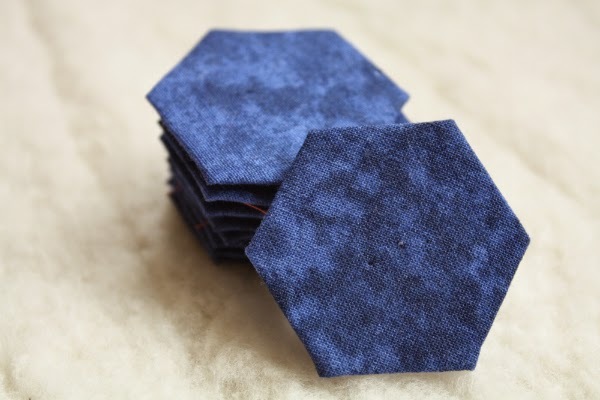 I have started basting more pieces for the last phase of my hexie flowers quilt, so I thought this would be a good time to post my first ever tutorial. 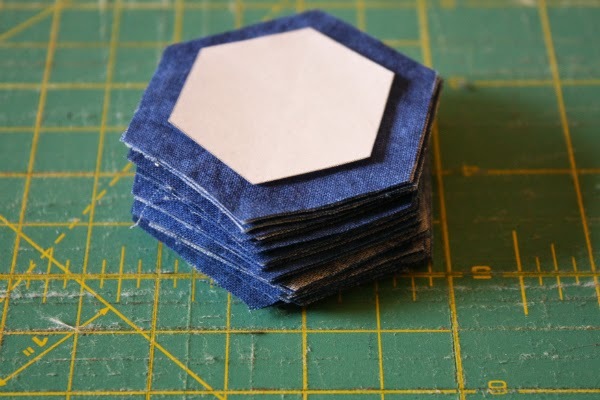 Here is my method of cutting and basting hexagons for english paper piecing. Warning: These are highly addictive! This stack is ready to go! I start with this page of hexagons, which I print from Cia's Palette. These hexagons are 7/8" on each side. You could also use plastic templates to draw your paper pieces, or some people use a 1" punch to cut the papers. I print mine on regular printer paper, taking it from the never-ending pile of scrap paper we have lying around. 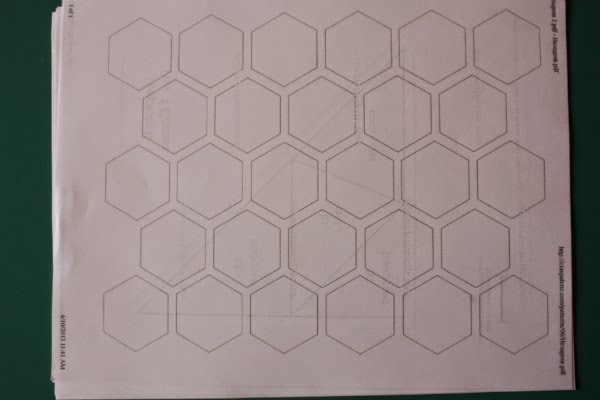 Carefully cut out each hexagon right on the lines. 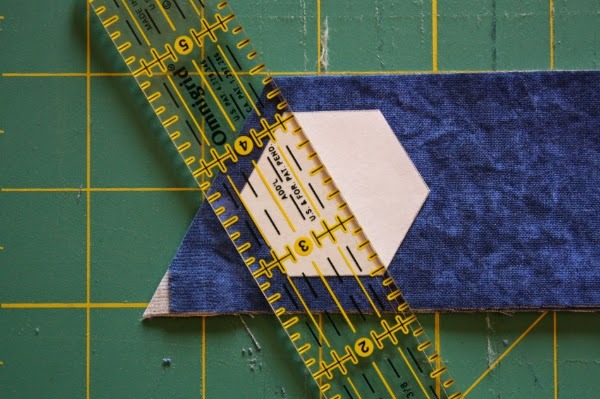 Using one paper template as a guide, decide how wide to cut your strips of fabric. 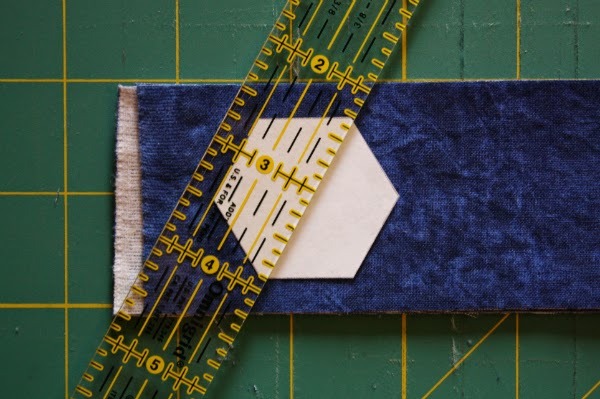 You want 1/4" on the top and bottom for the seam allowance. For mine, a 2" strip works perfectly. I cut as many strips as I need, then stack up to four layers. Place a paper template on the strip so you have 1/4" on the top and bottom, and a little room on the end. 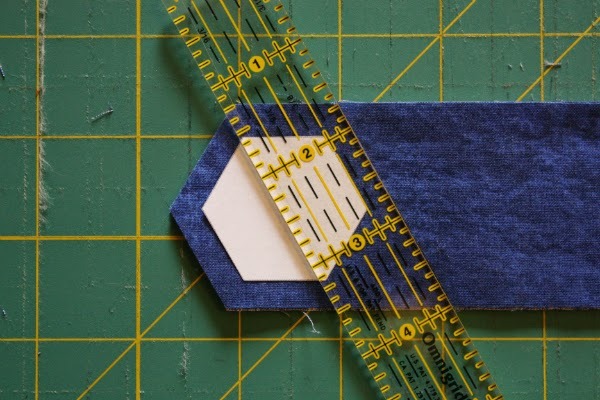 Align the 1/4" mark on your ruler along the top angle of the hexagon and cut off the excess. Do the same for the bottom angle. 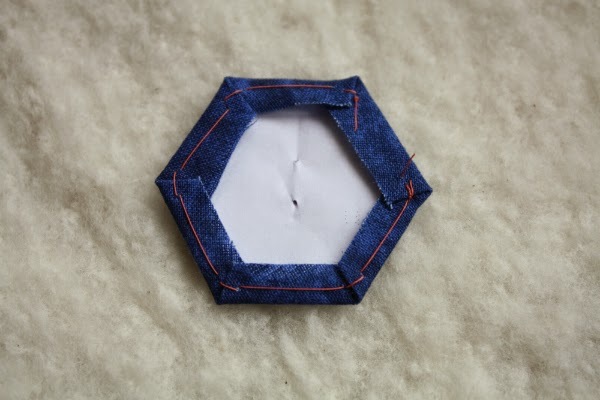 Without moving the paper template, cut the seam allowances on the other side of the hexagon. Move the paper template so it is 1/4" in from the edge and continue cutting. In only a few minutes you'll have a lovely stack of fabric pieces ready to be basted. 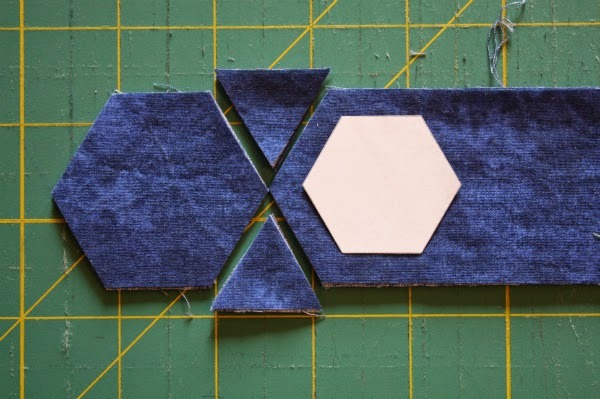 To baste the hexagons, start by gathering your supplies. 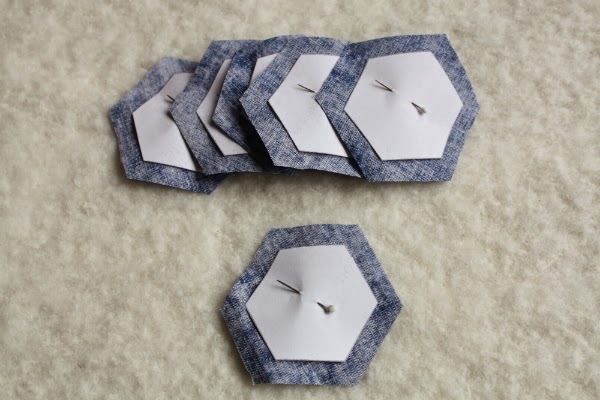 Along with your paper templates and fabric hexagons, you will need a needle, scissors, pins and thread. This is a great way to use up the last bits of thread on a spool, or those odd colours that have been hanging around for years. This thread will never be seen, so it doesn't need to match your fabric at all. 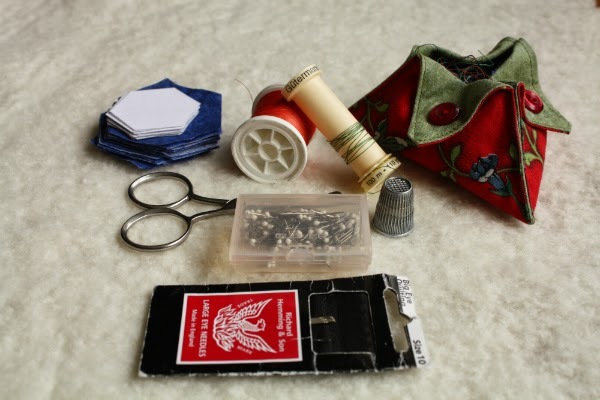 I also like to use a thimble and a thread catcher helps to make clean-up easier. 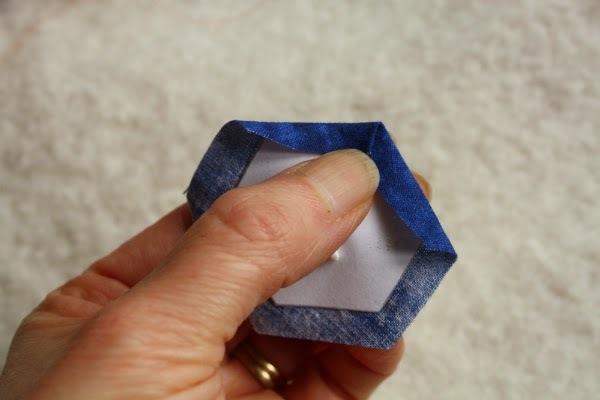 Start by pinning a paper template in the middle of a fabric hexagon. I like to pin a bunch at once. Thread your needle and knot the end. 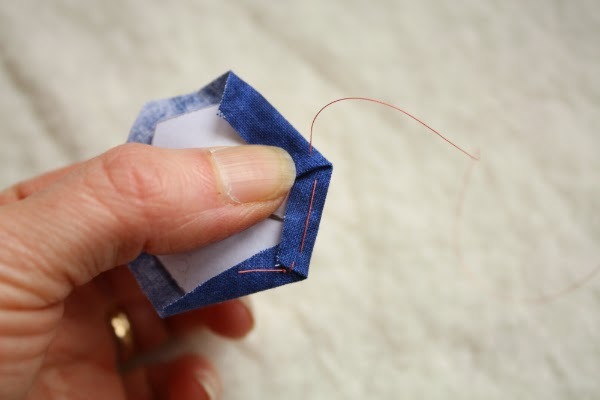 Carefully fold one side of the fabric over the paper template. You want to fold it right at the edge of the paper, making sure not to fold the paper too. Fold the next side over as well and hold it with your thumb. 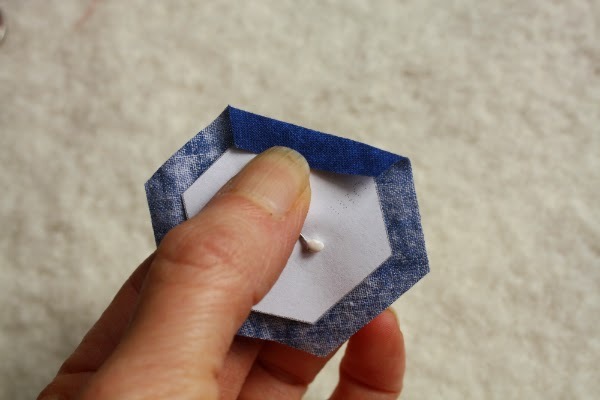 Stitch through the folded corner, without sewing through the paper. Sewing only through the fabric means you won't have to remove these basting stitches when your quilt is finished. And who wants to spend all that time removing stitches if you don't have to? 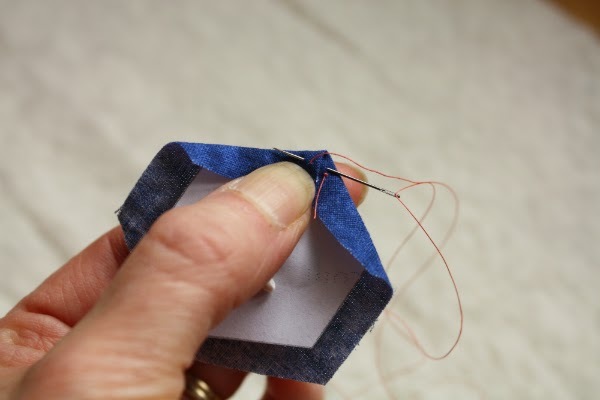 Then take another stitch through the same corner to secure it down. 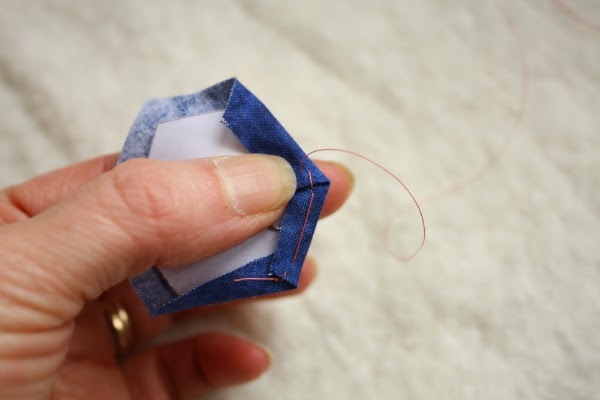 Turn the hexagon, fold down the next side of the fabric and take two stitches at that corner. Again, only stitch through the fabric, never through the paper. Continue working your way around, stitching each corner. Knot your thread again after the last corner. 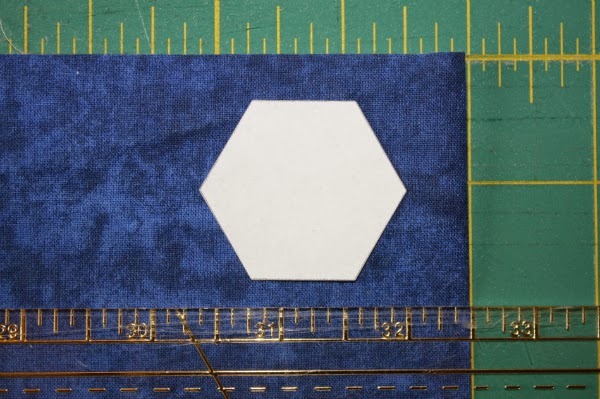 And there you have it - one epp hexagon, basted and ready to go! And as you can see from the front - no basting stitches to remove later. I hope you found this helpful. If you have any questions, just ask them in a comment. 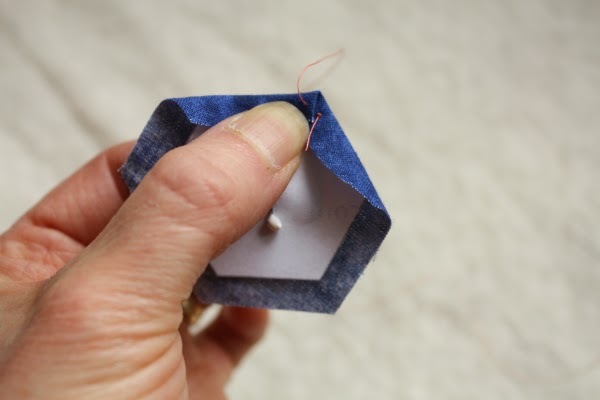 I have never stitched my EPP shapes this way but I like the idea of not having to remove the basting stitches so I will definitely be giving it a go. Congratulations on your first tutorial too! This has been such a fantastic project, Leanne and I can't wait to see more of the hexie flowers! Great pictures and explanation. Thanks for sharing. Nice tut. Never tried to use copy paper. Thanks for sharing.